In the last interview recorded at the University of Roehampton CC’s Anastasia Bakogianni talks to Dr Kathryn Tempest about her work on ancient rhetoric. Kathryn talks about her fascination with ancient oratory, and in particular the forensic speeches of Cicero. Her interest arose organically out of her previous work on the Attic orators, which then got her thinking about their impact on the work of the Roman politician. 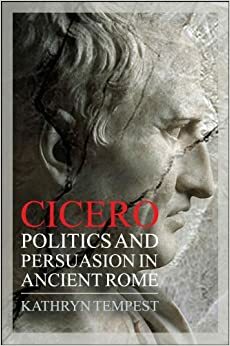 Her book Cicero: Politics and Persuasion in Ancient Rome was published in 2011 (reissued as a paperback in 2013). Kathryn tells us how her work on the Roman orator led her back to Hellenistic oratory. She talks about the debt that Roman orators, like Cicero, owe to this now largely neglected era in the evolution of ancient rhetoric. Different types of oratory were used in different periods, but the art of rhetoric continued to flourish and evolve in response to contemporary circumstances and specific needs. If you would like to learn more, you might be interested in the collection that Kathryn co-edited with Christos Kremmydas entitled Hellenistic Oratory: Continuity and Change (Oxford University Press: 2013). Kathryn is currently working on a book about Marcus Brutus, Caesar’s friend who was involved in the plot to kill him. She tells us about the challenges involved in dealing with the historical evidence that survives about this famous Roman, who was viewed both as a hero and an anti-hero. Follow this link to watch our interview, and to learn more about the art of persuasion and its classical roots. You might also be interested in an earlier CC interview with Professor Mike Edwards, which also explored the power of ancient rhetoric. Dressed in a Orange Pulse, Hyper Royal and Sail color scheme. This Jordan Why Not Zer0.1 features a full Bright Orange upper paired with Blue accents to give off that OKC Thunder vibe. Completing the shoe is a Sail rubber outsole.